This post is sponsored by Barber Foods, but all words, opinions, and images are 100% my own. Thank you for supporting the brands that allow me to bring you delicious recipes like this one! 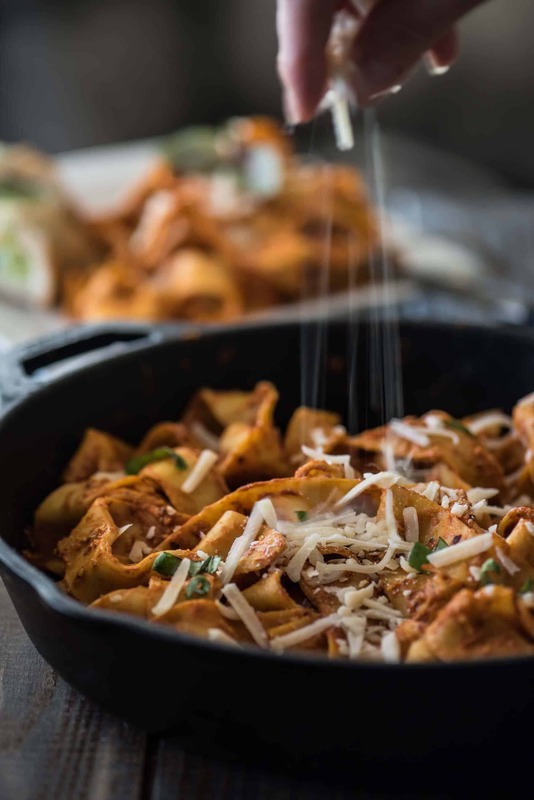 Elevate an easy entree with an equally easy homemade Roasted Red Pepper Pesto Pasta! 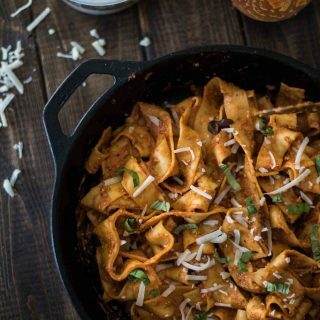 Pappardelle is a wonderful, hearty choice, but subbing in your favorite noodle will also produce delicious results! Oh crap. Yesterday was Valentine’s Day, wasn’t it? As if I didn’t know. I work for a corporate grocery chain, we live and breathe holidays two weeks before they arrive. Maybe my day job is the reason I despise V-Day so much. It couldn’t be the fact that it’s an overly commercialized guilt trip into showing someone you love them, could it? I mean, if there’s someone special in your life, shouldn’t you let them know every day? 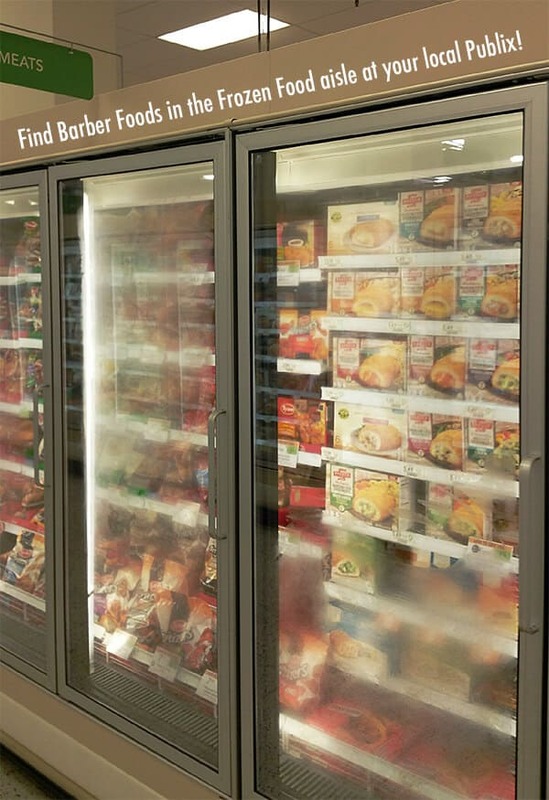 Why save it all for a cold day in February when you have to pay 50% more for a dozen roses? That’s why February 15th is one of the best days of the year – discount chocolate day! Now that’s real love…frugal indulgence. 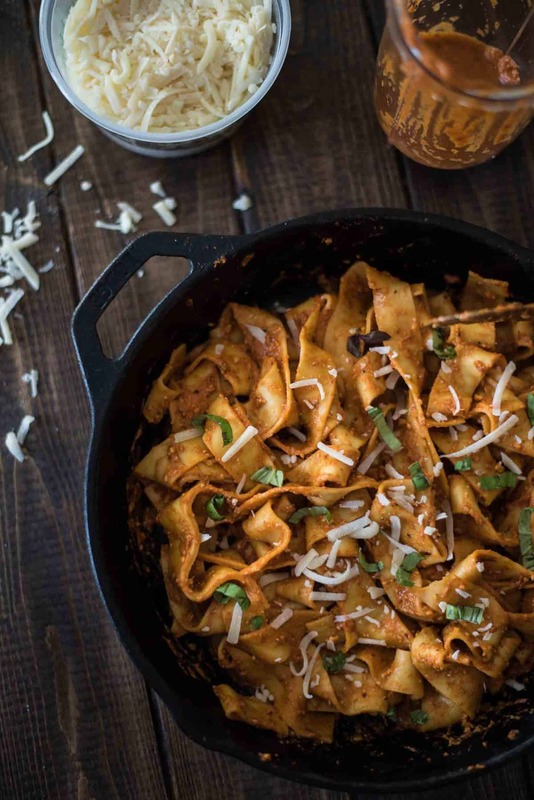 Pasta was meant to be a love language. One of these days, I’ll see it for myself with The Hubs in tow, and I’ll let you know if the association holds up. In the meantime, home cooked Italian dishes will have to do. 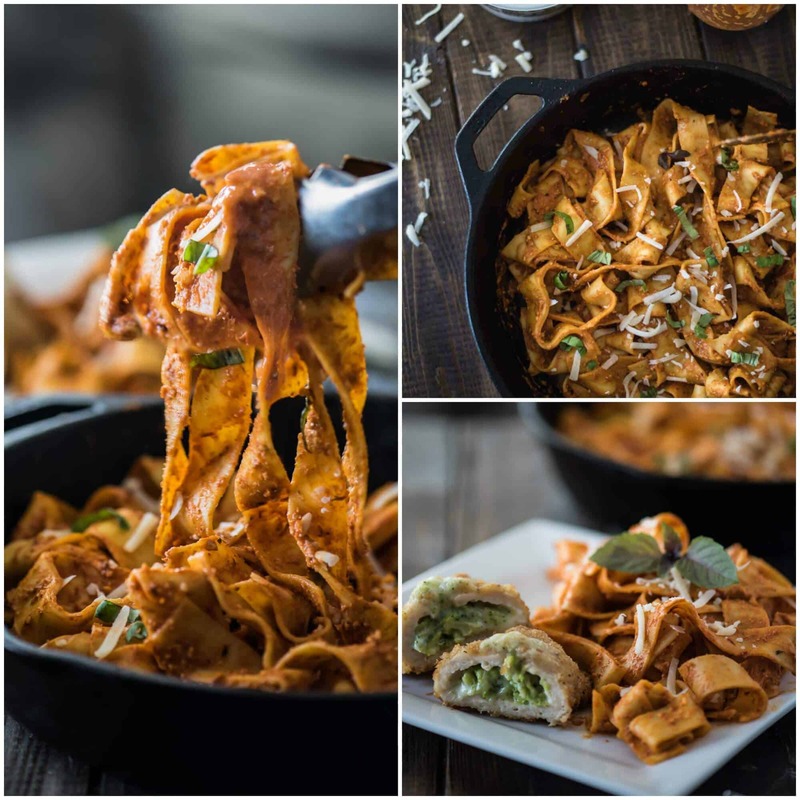 Roasted Red Pepper Pesto Pasta. Say it 5 times fast. Alliteration at its finest. One of my personal fave attributes of pasta dinners is how freaking quickly you can be burying your face in the finished product. If you’ve got your sauce ready to go, another 8-10 minutes is all that stands between you and carb heaven. 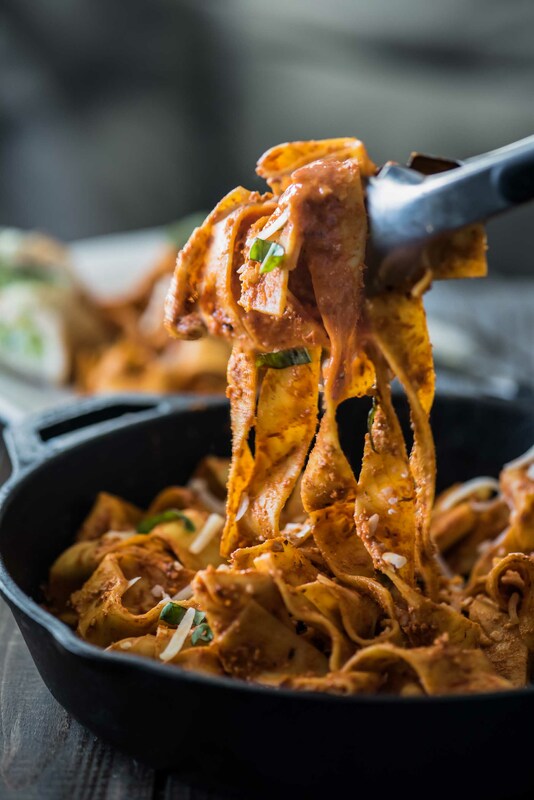 These beautiful Pappardelle noodles that I grabbed on my last visit to Trader Joe’s took 7 minutes and they were the perfect vehicle for the delicious Roasted Red Pepper Pesto I whipped up. Seriously. I know as a blogger that my vocab is limited when it comes to adjectives to describe the foods I make, but let me just throw the whole thesaurus at you and you can take your pick, because they all fit. 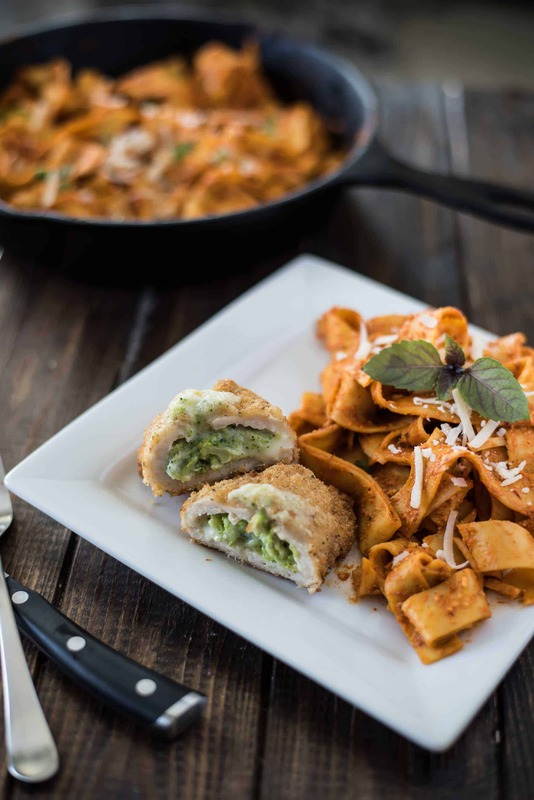 The flavors in this pesto were a glorious complement to the super easy Barber Foods Broccoli & Cheese stuffed chicken breasts I picked up on sale this week (you can’t beat BOGO +$1 off – here, have a coupon!) The peppers and the broccoli played well together – I love stuffed chicken breast, and I love it even more when I don’t have to stuff it myself. I’ve never met a pesto I didn’t like, but there’s something special about this one. I’m not normally a huge roasted pepper fan, yet somehow charring fresh ones on the grill and then roasting them in the oven makes them taste so much more amazing than the jarred ones I’m used to. Throw in some soft roasted garlic, red pepper flakes, fresh basil, your favorite nuts, and as much Parm as you can stand and you’ve got yourself a sauce worthy of a corner bistro in Bologna. Having a reason to use some of my purple basil for the first time is what got me really excited about making this, too. PURPLE BASIL, GUYS. I wish you could see how pretty it is! I mean, once it’s all pureed in the sauce, the color is lost, but if you know my struggle with keeping plants alive, you’ll be high-fiving me about this. So, pesto and pasta – check. Now, for the main event! 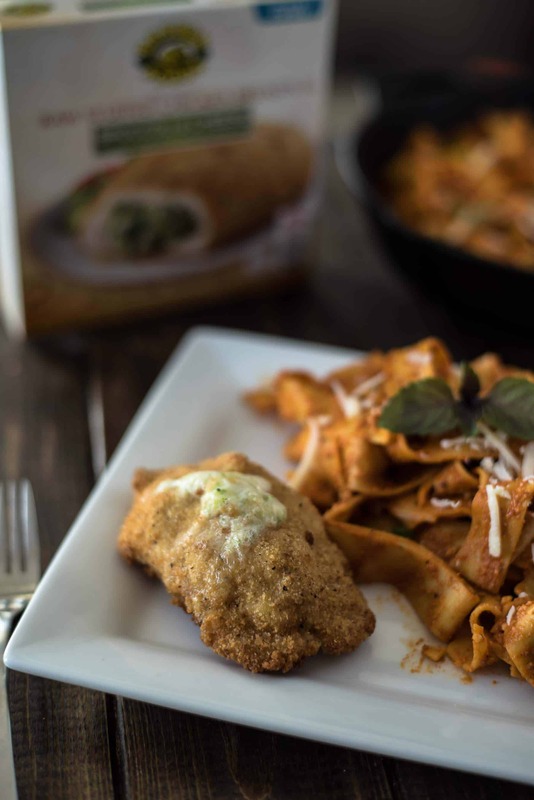 Barber Foods makes tasty dinners so easy and quick. 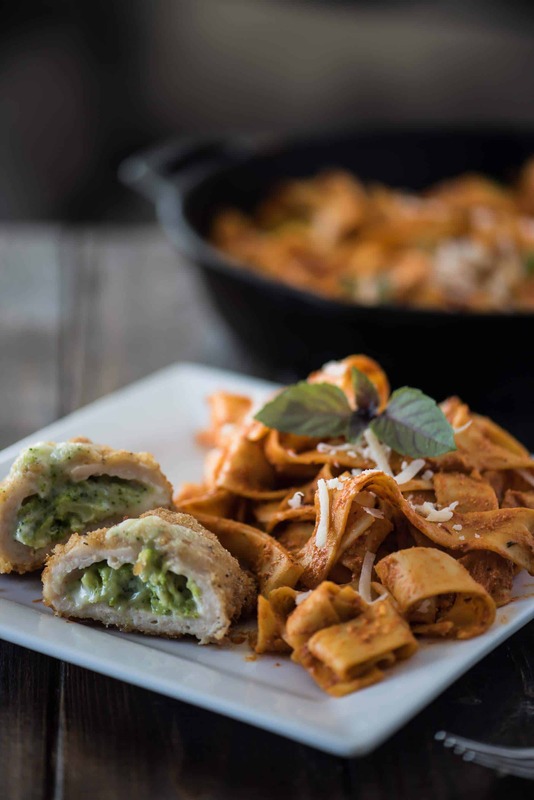 While your pasta water is heating up, preheat your oven to 375° F, remove the raw chicken breasts from the pouches, and pop them in for 33-34 minutes. Let them cool for 2 minutes or so while you toss your pasta and pesto, and dinner is served. Don’t forget the extra sprinkle of cheese! There’s no such thing as too much cheese. Preheat oven to 400 degrees F. Line a baking sheet with aluminum foil and place the peppers on, drizzling each with 1 Tablespoon olive oil. Peel outer skin from garlic bulb and cut the pointed top off, exposing the cloves. Place in a ramekin and drizzle with 1 Tablespoon olive oil; cover with foil. 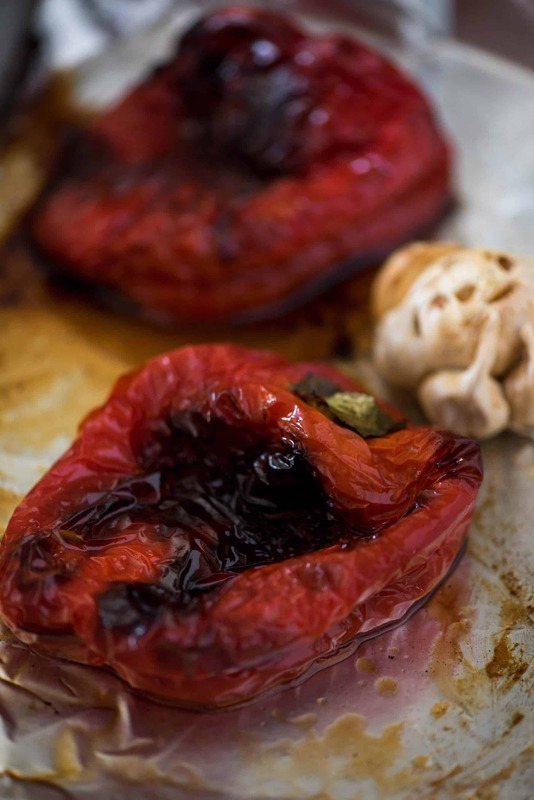 Place peppers and ramekin in oven and roast for 1 hour, flipping the peppers over after 30 minutes. Remove from the oven and cool 15 minutes, then use a knife to remove the stem, seeds and white membrane inside. Set aside. In a food processor, add the roasted garlic and almonds, pulsing until the mixture resembles a coarse meal. Add the roasted red peppers, basil, Parmesan-Reggiano, red pepper flakes, salt, and 2 tablespoons of olive oil. Pulse 1 minutes until mixture is smooth. Add more salt and pepper flakes to taste if desired. Bring a large pot of salted water to a boil on the stove top. Stir in pasta, return to boil, and reduce heat to medium, simmering 7-8 minutes until slightly al dente. Drain pasta, reserving about 1 cup of pasta water. Return pasta to pot and stir in pesto; add reserved pasta water ¼ cup at a time until desired consistency is reached. Top with Parmesan and basil and serve with your favorite (Barber Foods) chicken. Enjoy! Want to have your own #BarberNight? 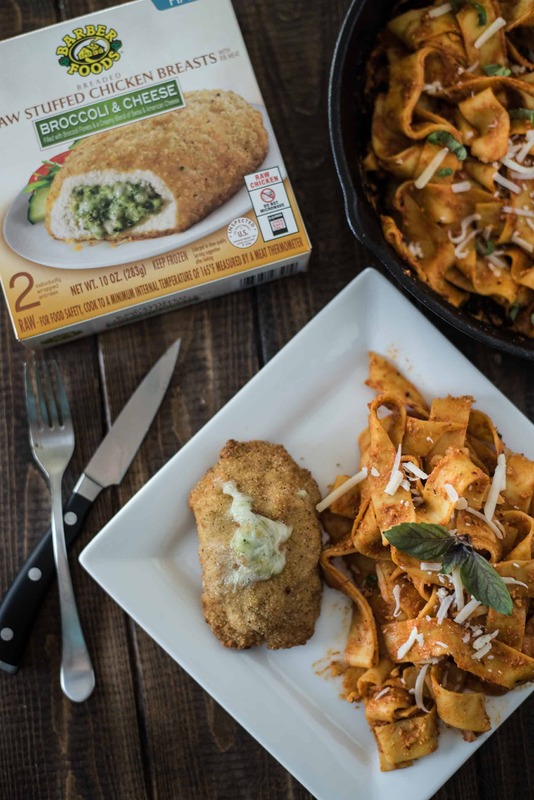 Pick up some Barber Foods chicken at your local Publix or Walmart, or find a retailer near you that carries these deliciously easy dinner solutions!